Roberto Martinez's side have completed the signing of the 19-year-old midfielder, on a three-year-deal, from Aberdeen. 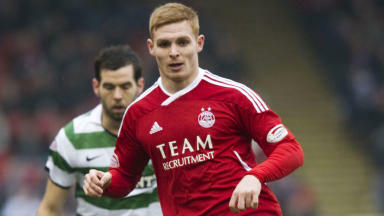 Wigan have completed the signing of Aberdeen's Fraser Fyvie for an undisclosed fee. The Premiership side beat Fulham to the capture of the highly rated youngster, who passed a medical at the DW Stadium on Monday. Fyvie made his debut at Hamilton in 2009, winning the man-of-the-match award in a 3-0 victory. He scored his first goal for the club later that season in a 3-0 win over Hearts, becoming the youngest scorer in the history of the SPL. The tenacious midfielder went on to make 66 appearances for Aberdeen, scoring three goals. With his contract due to expire at the end of 2012, the player decided that he wanted to try his luck in the Premiership, and Aberdeen opted to cash in on the Scotland under-19 player. Roberto Martinez told the Wigan website that he was delighted to have completed his first capture of the season. He said: "I'm excited because we're signing such a strong character and a great personality at just 19 years of age. "He's got a tremendous future in his hands and we're all delighted that he's making a big step forward in his career here at Wigan Athletic. "He's a bright young man and will have a good environment here in which to develop with players that have been through similar experiences and of course our fans who I know will make him feel very welcome and allow him to develop over the coming months. "Also you have to remember that for such a young player he's played a lot of games in the SPL at a high standard which shows his maturity." Fyvie will now join up with fellow Scottish players Gary Caldwell, Shaun Maloney and James McArthur, while Roman Golabart, Conor Sammon and James McCarthy have all spent time in the SPL. Martinez added: "Together with the rest of the squad and, of course, the other Scottish boys in the squad he'll settle in quickly I'm sure, but he's so eager to get going and take advantage of the good experience within the Dressing Room."